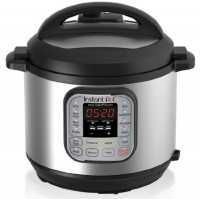 Instant Pot DUO60 6 Qt 7-in-1 .. Product weight is 11.8 lbs. Duo, the number 1 selling multi-cooker, combines 7 kitchen appliances in 1, Pressure Cooker, Slow Cooker, Rice Cooker, Steamer, Sauté, Yogurt Marker and Warmer, prepares dishes up to 70% faster to support your busy lifestyle Features 14 Smart Programs - Soup, Meat/Stew, Bean/Chili, Poultry, Sauté/Simmer, Rice, Multigrain, Porridge, Steam, Slow Cook, Keep Warm, Yogurt, Manual, and Pressure Cook. Now, your favorite dishes are as easy as pressing a button Healthy, stainless steel (18/8) inner cooking pot made from food grade 304, no chemical coating, 3-ply bottom for even heat distribution, fully sealed environment traps the flavours, nutrients and aromas within the food Built with the latest 3rd generation technology, the microprocessor monitors pressure, temperature, keeps time, and adjusts heating intensity and duration to achieve your desired results every time.Product Dimensions: 14.17 x 14.84 x 13.31 inches UL and ULC certified with 10 safety mechanisms to provide you with added assurance, designed to eliminate many common errors.Accessories include, stainless steel steam rack with handles, rice paddle, soup spoon, measuring cup, condensation collector and recipe booklet Power supply: 120V - 60Hz Instant Pot is a smart Electric Pressure Cooker designed by Canadians aiming to be Safe, Convenient and Dependable. It speeds up cooking by 2~6 times using up to 70% less energy and, above all, produces nutritious healthy food in a convenient and consistent fashion. Instant Pot Duo is a 7-in-1 programmable cooker, it replaces 7 kitchen appliances as it has the functions of a pressure cooker, slow cooker, rice cooker, steamer, sauté, yogurt maker & warmer. 14 built-in smart programs (Soup, Meat/Stew, Bean/Chili, Poultry, Sauté, Steam, Rice, Porridge, Multigrain, Slow Cook, Keep-Warm, Yogurt, Pasteurize & Jiu Niang) cook your favorite dishes with the press of a button. A 24-hour timer allows for delayed cooking. Automatic keep-warm holds the temperature of the food until you serve it. Instant Pot generates almost no noise and leaks no steam. It traps all the aromas in the food without heating up the kitchen. The 3-ply bottom stainless steel inner pot is extremely durable and leaves no health concerns associated with non-stick coatings. The slim body design has lid holders for both left and right handed users. The brushed stainless steel exterior is finger print resistant. Its elegant and durable design makes it easy to clean and pleasurable to use for the years to come. Instant Pot Duo uses the latest technology with an embedded microprocessor, which monitors the pressure and temperature, keeps time and adjusts heating intensity. The cooking programs have been lab-tested hundreds of times for optimal effect. These greatly improve cooking result and maintain consistence. Instant Pot is carefully designed to eliminate many common errors that could cause harm or spoil food. It passed the stringent UL certification giving you uncompromised safety and peace of mind and protects you with 10 proven safety mechanisms and patented technologies. Instant Pot IP-DUO50 7-in-1 Programmable Pressure Cooker with St.. I am a senior non-cook male who was suddenly faced with feeding myself after my wife passed away. The Instant Pot has been a marvelous help. With it I can cook meat (poultry, beef, pork), potatoes, carrots, corn all together with excellent results. Everything cooks to perfection within about 30-40 minutes. All I have to do is put the ingredients in the pot, push a button, and leave for about 30 minutes. Voila! Instant dinner. I have also cooked rice as a kin..
David A. (Tacoma, WA USA.. Instant Pot IP-DUO60 7-in-1 Multi-Functional Pressure Cooker, 6Q..
Over the years, I have purchased hundreds of items from Amazon, and for the most part, got what I expected. I never reviewed any of them. But from the moment I received my Instant Pot, I felt that I had purchased something that not only exceeded my expectations, but will make my life easier (and more delicious)!I am a holistic nutritionist and a follower of a lower carb/paleo/primal lifestyle (and yes, it is not only a food regimen, but a lifestyle). Many of the..